The students, who were engaged in a two year diploma programme, were admonished to show the same dedication, discipline and sacrifice which they displayed during studies, as they go out into the world to teach the word of God. The admonition came from Orman Alexander, pastor of the Apostolic Faith Church, Campden Park, where the ceremony was held. Alexander, also a tutor of the Harvest Time Bible Institute, told the students during the Pastorâs Report that the success of their experience rests in the willingness to go beyond their comfort zones. âI give God thanks for allowing me to shape you for future ministry. I know how training courses increase your effectiveness for Ministry. Featured speaker on the night, Glenda Robinson, in her delivery, offered advice to the graduating class as they made the transition from students to teachers of The Word. Robinson reminded the graduating class that what was studied would never be enough, and that they had only scratched the surface in their two years of studies. She said that they should have developed character that would prepare them for the task ahead, and the application of what they were taught is evidence that they have learned. Valedictorian Randy Boucher, who spoke on behalf of the class, acknowledged the contribution of the tutors, family members and friends who all made their studies bearable and graduation a dream come true. Boucher, no stranger to valedictory speeches, also admonished his classmates to turn the challenges that they will encounter during their journeys as opportunities. During the two years, the graduates were involved in studies of the New Testament, biblical prophecies, doctrines of God, along with other topics and projects. 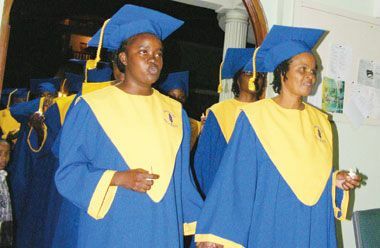 The other graduates included Cheryl Allen Gumbs, Keziah Browne Malcolm, Cynthia Charles, Leroy Charles, Omoron Commissiong, Gary Delpleche, Jessica Fairbairn, Edris Holder, Lafleur Jacobs, John Jacobs, Joy Kennedy, Sophia Lewis, Sheverne Marshall, Christopher Peters, Enika Peters and Eileen Wilson.